ITS has published its fifth consecutive annual report. The 2017-2018 Annual Report shares the department’s achievements over the past year in enhancing the technology capabilities for the UNC-Chapel Hill campus community. ITS has focused over the past academic year on making it easier to conduct the work of the University and improve the tech for its academic, administrative and research users across campus. The annual report showcases how, during 2017-2018, ITS focused on efficient, effective and innovative technology and how the organization enabled customer success. In fact, the report features 18 customer stories and testimonials about customers’ use of ITS services and support. As the annual report illuminates, in some cases ITS enhances tech capabilities and enables customer success through complex “behind the scenes” technical endeavors, such as the new network core, that while transparent to the end user requires significant IT resources and expertise. In other cases, it’s through smaller changes that users notice and actively use, such as the new software download service and the new exam-scanning tool. One of ITS’ key achievements to improve efficiency from the past year was the introduction of the Faculty Portal. ITS heard from the University’s academic community that it could often be challenging to find important, commonly used links in ConnectCarolina and other academic and research-related activity. The Faculty Portal now puts the teaching and research information faculty use most on the first screen they see when they log in to ConnectCarolina. Making University operations more efficient and effective also means making it safer. In the past year, more than 25,000 phishing messages were reported and more than 31.55 billion — yes, billion — unwanted network connections were blocked by UNC-Chapel Hill firewalls. In an effort to better protect the campus, the Information Security Office within ITS launched projects to expand 2-Step, improve the risk-assessment process and create phishing-awareness activities. ITS’ campus partners have been integral in the success of the department’s information security messaging, and the fruits of those efforts are clear: as of June 30, more than 50,000 individuals were registered for 2-Step Verification. The annual report also provides customer stories to help translate the technical projects into practical impact. These stories are sprinkled throughout the report, but can also be read in one section to learn more about how ITS empowers individuals and groups on campus. ITS’ customers’ success can also be appreciated when reading about the organization’s “Most Lunches,” at which ITS celebrates individuals who have executed the most transactions in ConnectCarolina. Speaking of looking forward, one story within the annual report acquaints readers with ITS’ four strategic focus areas for the 2018-2019 fiscal year. This story includes a link for downloading a PDF that provides more details about ITS’ focus areas and all of ITS’ planned projects for the year. “Where the annual report reflects back on what we’ve done, the focus areas help us align our work for the coming year,” Kielt said. 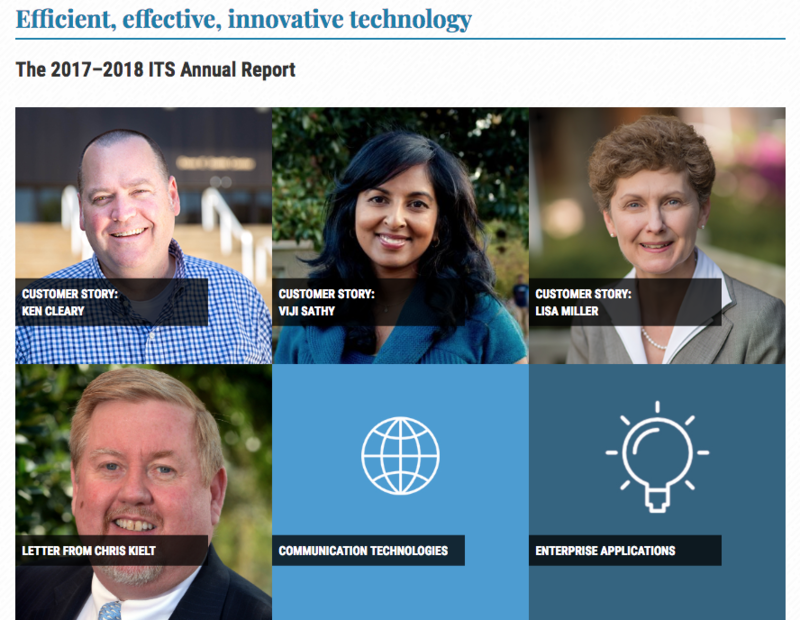 The ITS annual report utilizes WordPress. The entire report is available in digital format only.